At Whiteman Dental Associates in Boston, MA, our patients have options when it comes to tooth replacement. But for the right candidates, dental implants are considered the best solution for replacing missing tooth roots. If you are undergoing dental implant surgery, read on to learn what to expect during dental implant recovery. Here, Dr. Daniel Whiteman offers tips to help you get through the healing period. After receiving your dental implant, be careful around the surgical site; your gums and mouth will be slightly tender and sensitive for the first few days. Immediately following your procedure, continue to switch out new pieces gauze every 30 minutes until bleeding lessens considerably. It is normal for blood to be present in the mouth for up to 48 hours, but if severe bleeding occurs, contact our office. Spend the first day resting, and do not lift heavy objects or bend over. Keep other physical activity to a minimum. Brush your teeth as normal, but avoid the surgical site for the first 48 hours. For the first couple days, do not vigorously rinse or touch the surgical site. Leaving it alone as much as possible is the best way to help the healing process. After 36 hours, rinse with a salt water solution or other medicated solution provided by your dentist. This will help keep the surgical site clean and free of infection. Stiff jaw muscles and sore gums are normal for the first few days. Use pain medication as prescribed from your dentist, or over-the-counter options, as long as pain continues. Safe: Dental implants are fabricated from titanium and have been used, researched, and studied in patients for well over 30 years. Titanium’s unique properties help it integrate well with your natural bone and gum tissues. 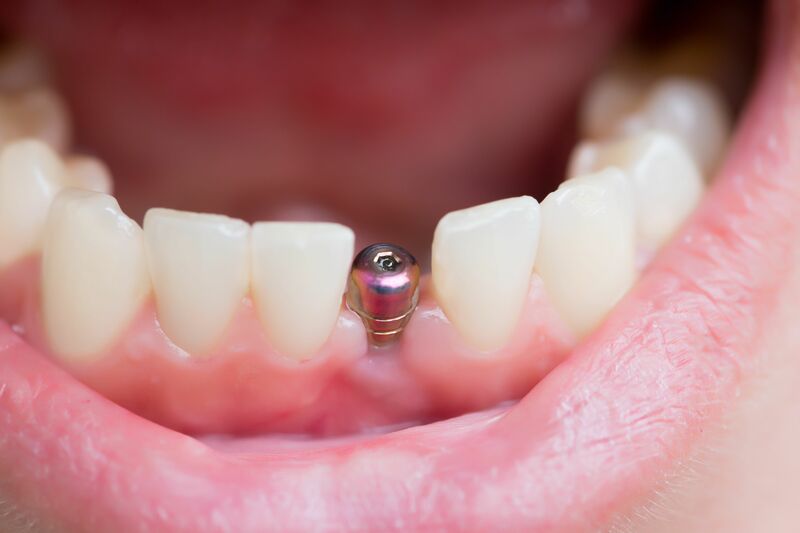 Permanent: Once placed, dental implants can last a lifetime. If taken care of properly, no replacement implant will be needed. Prevent bone loss: Placing an implant in the jaw prevents the bone tissue in that area from weakening, and helps to stabilize the entire jaw. Stable: After tooth loss, other teeth can shift or move because of the gap left in the jaw. Implants fill the space left vacant, keeping teeth in their right place. The reason for dental implants’ numerous benefits has to do with a biological process called osseointegration. This is when bone tissues develop around an object that has been placed inside a bone structure. Similar to how jaw bone tissues develop around a tooth root to hold it firmly in place, the jaw bone will also develop around a titanium implant. Osseointegration happens over four to six months after the implant placement procedure, and if successful, will keep the implant in place permanently. Dental implants restore your jaw and mouth after tooth loss. Many patients experience slight discomfort during the procedure and recovery, but find its many benefits outweigh any inconveniences. To schedule a consultation about one of our restorative dentistry services, contact our practice at (617) 731-4746.